The Jiko Chap Chap produces efficient wood burning cook stoves that complement African cultural cooking styles. These ergonomic alterations provide more cooking options by allowing up to three pots to be cooked at once with a single fire. In small, crowded indoor spaces, open fires often result in injuries, but the Jiko Chap Chap allows the fire to be contained within the metal confines of the stove. The stove top is grooved to prevent pots and pans from slipping, and to allow the cooker to stir food contents without holding onto the pots. The unit also has a vertical feeding system which allows for the burner to stoke itself. Therefore, cooking can be left unattended for short periods of time. 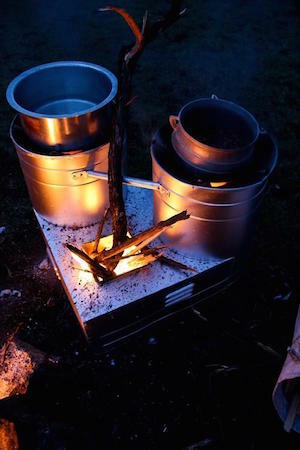 Develatech's efficient stoves reduce wood consumption by 60% and CO and particulate emissions by 87%. With every stove comes a pack of 30 indigenous tree seeds and an information booklet explaining how to nurture the seedlings. Development of the Jiko Chap Chap began in Nairobi, Kenya but it has now been distributed to other areas such as in India and South Africa. Develatech manufactures stoves in many different sizes to suit varying cooking requirements and consumer budgets.